whether the time of post and a log of the participants’ actions is shown to all participants. 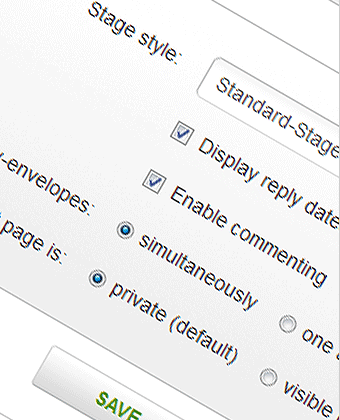 whether there is a comment function available underneath the envelopes. whether the envelopes are opened at the same time or one after another at the time of publication. latershares are usually private, meaning only visible for participants. They can be, however, declared public. After editorial checks, they appear in the public latershare feed. Soon, more stage designs will be available, so that a fitting design can be chosen.